Over the years, Pixar has pretty much dominated the field of CG animated films. Sure, there have been plenty of competitors, such as Dreamworks ('Shrek') and Blue Sky ('Ice Age') but nobody has really been able to knock Pixar off its pixelated throne. Enter ILM, a company known primarily for its strength in special effects. If 'Rango' is anything to go by, Pixar may finally have a serious adversary. 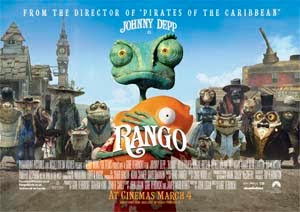 'Rango' is an adventure-comedy about a lonely pet chameleon (Johnny Depp) with aspirations of adventure and heroism. Rango gets his chance when he is left in the Mojave desert and accidentally becomes the sheriff of Dirt, and Old West town inhabited by desert animals. The single most remarkable thing about this film is how great it looks. From the texture of the characters' skin to the cracks in the run-down buildings that make up Dirt, the level of detail that ILM have created is breathtaking. The colours are so clear and the animations so sharp that the film is sure to become a TV-showroom favourite when it is eventually released in high-definition. Gore Verbinski's previous experience directing live action certainly helps, as does consultation from 'True Grit' director of photography Roger Deakins. Everything is expertly framed, and would not look out of place in a "proper" Western. Despite being an animated film, 'Rango' has beautiful cinematography. It's not all about the looks though. 'Rango' is very well written, especially when it comes to its humour, which flows seamlessly from deliciously witty dialogue to Buster Keaton style physical gags. The humour is at its best when the film goes into parody mode, making fun of the seriousness in the Western genre with a plethora of references that is part homage, part piss-take. Surprisingly, 'Rango' is a Western first, and a kid's film second. The story is a tried and tested Western trope, and works well in the film despite the fact that everybody is an animal. It is the classic "stranger comes to town" formula, where the stranger must prove himself to people and eventually become their hero. Sure, it is a comedy, but Rango's story is told with such earnestness that one can't help but take him seriously. The best animated films are the ones that cater to the adults as as well as a younger audience, and this is very much the case with 'Rango'. Beneath the surface of primary colours and animated animals lies a surprising amount of maturity. Themes of heroism and bravery are old news, but existentialism and surrealism in an animation has to be pretty rare. Rango spends the entire film struggling with his lack of identity and his search for meaning in life may bore younger viewers, or go over their heads entirely. With 'Rango', ILM have created one of the most grown-up animated films to date. Its interesting blend of seriousness and humour also makes it one of the most unique. 'Rango' is a great family film, just don't expect it to be quite like 'Finding Nemo'. 'Rango' is in cinemas throughout the UK now.